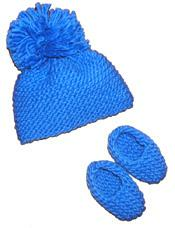 Knit this adorable chunky baby hat and bootie set in no time flat! Hat is knit flat, with simple decreasing at the top. A big pom-pom gives it extra flair! The yarn is a soft, easy-to-knit wool/mohair blend. The booties are knit in one piece, with simple increasing and decreasing. All techniques are fully explained in the pattern and there are NO abbreviations. No purling required either! Knit on size 10-3/4 needles.